A far more straightforward and lightweight proposition than its stablemate Diva, Repro-1 is a delicious slice of synth history in perfectly realised plugin form. Two extra modulation slots . Oscillator, filter and LFO freqs shown as percentages rather than in Hz. A sort of spiritual follow-up to the highly acclaimed Diva, Repro-1 is a component-modelled emulation of one of the most iconic monosynths of the 80s: the Pro One, Sequential Circuits’ monophonic take on the polyphonic Prophet-5. The interface centres on the Synth page, which recreates - albeit with a few additions and changes - the look and layout of the Pro One. Behind that are the Tweaks page, Sequencer panel and Presets browser, the last housing 500 patches, including all 20 of those printed in the Pro One manual. Being essentially a 35-year-old design, it should come as no surprise that Repro-1’s architecture is comparatively basic. In a nutshell, two monophonic oscillators and a low-pass filter are brought to life by a handful of modulation sources, an arpeggiator and a step sequencer, and processed with a quintet of newly added effects modules, all from a single panel. u-he hasn’t worked in a polyphonic mode of any kind, so you won’t be making pads with it any time soon - it’s still all about mono basses, leads, plucks, drums and suchlike. Oscillator A outputs saw and/or pulse waves, while Osc B generates saw, triangle and pulse waves. Pulse width knobs alter the duty cycles of the pulse waves, oscillator A is hard syncable to Osc B, and Osc B’s Lo Freq setting slows it down to sub-audible speeds for use as a second LFO. The outputs of the two oscillators are blended in the Mixer section, along with a white noise generator or bass-boosting feedback circuit. The 24dB/octave resonant low-pass filter is edgy and sharp, self-oscillates like a champ, and is open to modulation by key tracking, its own dedicated ADSR envelope and more (see below). The modulation options in the Synth page mirror those of the Pro One exactly. First, there’s an ADSR envelope hardwired to the amp, with adjustable curve. Then there are three routable mod sources - the Filter Envelope, the output of Osc B and an LFO (with host sync and the same three mixable waveforms as Osc B) - each of which can modulate any of five possible targets: the Frequency and Pulse Width of both oscillators, and the Filter cutoff. The output signal from each source is sent to either of two busses - Direct and (mod) Wheel - and each destination is set to ‘receive’ on one or the other of said busses, making it easy to mix regular and wheel-modulated movements. The Perform section next to the keyboard steps outside the Pro One template by adding a pair of open-ended modulation pairings, linking two from an assortment of sources (Trigger, Gate, Expression, LFO, Key Follow, Velocity, Aftertouch, Amp Envelope, the ASR/AR envelope of the Jaws effect, etc) to any synth and effects controls via drag and drop. The Tweaks page ‘removes’ the top panel of u-he’s virtual Pro One to reveal the PCB beneath and expose ten under-the-hood adjustables. The Oscillator and Filter menus offer a handful of alternative circuits. For the oscillators, the default option (called Ideal) is u-he’s modern, punchier take on the Pro One’s signal generator, but this can be switched out other options. The Amp and Filter Envelopes boast four alternative models, including a useful One Shot mode for percussion sounds. saw waves bipolar, switch between lowest- highest- and last-note priority, and set cutoff to track pitchbend as well as note pitch when filter Key Track is activated. The Tweaks page could be described as an overly flamboyant means of getting at a set of extra controls that could have easily been included in the main Synth page, but it’s clear that u-he wanted to keep the front panel as uncluttered and true to the look of its inspiration as possible. We wholly approve. The Arpeggiator is as rudimentary as they get, with just Up and Up/Down directional options and a Latch switch (which at least improves on the kludged latching of the Pro One). The step sequencer gently expands on the real thing by upping the maximum steps from 40 to 64 (in two alternating banks of up to 32 steps each), and adding per-step velocity, tie steps, and a Rest button for adding gaps when step-recording sequences. At the bottom of the interface, tabbed alongside the keyboard, is a series of five effects modules that obviously broaden Repro-1’s remit far beyond that of the Pro One. Jaws is an awesome envelope/LFO-modulated wavefolder that serves up stunning distortion and FM-style noises, and that u-he really ought to release separately; Lyrebird is a ‘bucket brigade’ delay/chorus/flanger; RESQ works as a semi- parametric three-band EQ or triple band-pass resonator; Drench is a plate reverb with pre-delay; and Sonic Conditioner is a combination transient shaper and stereo widener/narrower. The effects can be rearranged by dragging their bypass blocks up and down in the FX Chain (alas, the modules themselves don’t move), and all five sound fantastic. 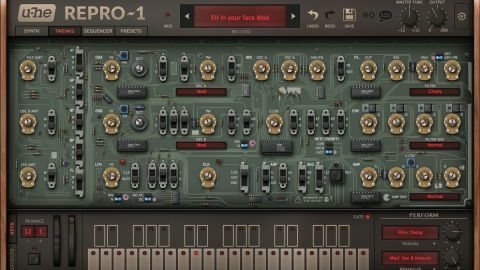 Repro-1 is as good a plugin version of Sequential Circuits’ feisty little monosynth as we’re ever likely to see and hear, delivering all the snap, bite, warmth and soul of the hardware, but with the convenience, flexibility and pricetag that only software can bring. Fans of the original will be blown away by the authenticity of its sound and response, and have a ball with the integrated effects and extra modulators; while newcomers to this historic instrument will love its easy programming and phat, rich, focused tones. The Tweaks panel enhancements, meanwhile, are the icing on the cake, extending the sonic palette in a meaningful way. Yes, in architectural terms Repro-1 is a very simple synth by today’s standards, even with the bits and pieces added by u-he, and that may or may not be an issue depending on your expectations and stylistic needs. As ever, though, it’s the sound that counts, and in that department Repro-1 is an unmitigated success.